Your and your spouse are on a long overdue road trip around the USA and as you check into your first hotel you wonder “What are the places that deliver donuts near me?” Read on to see the best places that deliver donuts when you’re outside Houston. Are You Wanting Do-Nuts For Breakfast? Photo courtesy of Dougnut Plant in NYC. 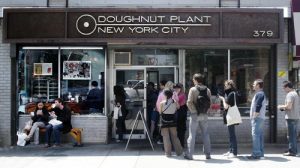 New York City-Doughnut Plant LES. Mark Isreal started Doughnut Plant in a basement bakery in 1994. He used his grandfather’s specially honed doughnut recipe and baked all night for his morning deliveries. By 2000 with the help of his father and brother he was able to move into the famous 379 Grand Street location on the Lower East Side of Manhattan. Doughnut Plant is known for a variety of flavors, and, interestingly, shapes. His shop makes square-shaped donuts filled with homemade jelly and other flavors like coconut cream and PB and J. The best part is that they use Doordash for delivery just like Shipley Do-Nuts! A few delivered square donuts later and you and your spouse are ready to explore the city and beyond. Looking for Do-Nut Shops That Deliver Near You? You’ve seen the scenes of NYC and are headed south to Toms River to see family. As you drive up to your brother’s home ready to spend the day with him on the beach you suddenly remember: you were asked to bring snacks! “We’re already here! What can we bring now? DOI!” You pull out your phone and google “places that deliver donuts near me.” Soon, three dozen sugar raised donuts from Ob Co’s Donuts arrive at your door! Ob Co’s Donuts started in 1953. Located at 547 Fischer Boulevard, Toms River, Ob Co’s opens at 5 AM and closes when they run out of the holey dough to serve. Locals know the donuts are good and ready when the string of colorful lights outside is shining. 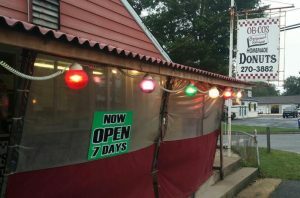 With lines going out the door, this deluxe donut shop has raised itself to be a staying current in Toms River. After a few days of waves, eating donuts in the sand at sunset, and catching up with your brother you decide to see an old friend in Philadephia. It’s been a long while and you guys can’t wait to meet up to have a classic movie marathon. You and your spouse nod. That’s when you Google the magic phrase, “places that deliver donuts near me.” Soon two half dozens of Cookies and Cream and S’Mores donuts are delivered to your friend’s door. 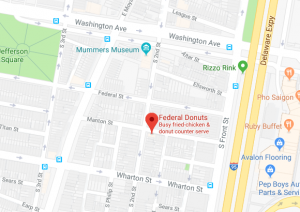 Federal Donuts started when the owners Michael Solomonov and Steven Cook were eating Korean chicken wings with friends and decided they wanted open a restaurant that sold three things: Donuts, coffee and chicken wings. They serve donuts in the AM and fried chicken in the PM. If you’re interested in how this new take on a classic treat came to be, check out their book on Amazon. The book also features several donut recipes because Federal Donuts believes one of the best things about good food (besides eating it) is sharing it. You’ve finally reached the end of your trip. You’ve been to 30 Rock, talked with your brother on the beach, saw an old friend and took your taste buds on a donut detour they won’t soon forget. As you unpack you realize a little delivery from Shipley Do-Nuts is all the “Welcome Home” you need. Within the hour an order of cake and glazed donuts arrive at your door. Ah…home. We’ve been making delicious donuts since 1936. If you’re craving the classics, or just want a taste of Houston, click below to order Shipley Do-Nuts today. We have all types of donuts from caked to glazed, kolaches, and let’s not forget our French Quarter beignets.